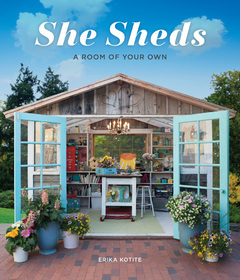 I was recently sent a copy of the new book by Erika Kotite that is a wander through the world of she-sheds. Now I am going to have to say up front that I am not a huge fan of binary notions (she sheds, man sheds etc) but the idea of a 'room of your own' did appeal to me as an exploration into creating personal space. Add to this I am currently in possession of two decrepit sheds that I intend to replace soon with a more practical and useful shed, and suddenly a discussion about sheds is very interesting to me. The book is much more than the title might suggest. I had expected a description and pictures of various sheds. Erika does do this, starting by talking about different styles of sheds and then looking at different sheds created by for different purposes by various women. There are sheds for gardeners, artists, back yard getaways and so on. The sheds are located mainly in the US, but there are some from the UK and other parts of the world. Some look better equipped than my house and they are all definitely well constructed and beautifully put together. The detail of some of them is truly wonderful. I did think it would be nice if I could choose a favourite from the shed portraits in the book. In reality I have favourite parts from different sheds. The inspiration that this book gives is not to encourage us particularly to copy one of the sheds, but to find the bits you like and put your own mark on your own space. 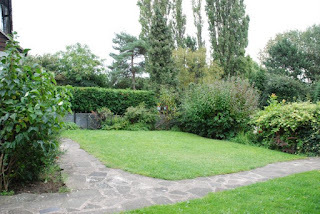 So where are my favourite bits from: the Corn-crib conversion is a functional shed for a gardener and obviously that is going to appeal to me. The outside is a little fancy though for what I would want. The Year Round Potting Shed has good windows and is less frilly. Cindy's Shed by the Sea has a green roof and I would love my shed to have a green roof. But if I was forced to pick my favourite shed from the whole book, I would choose the one that is most impractical for what I want but it reaches out to me more than all the rest. I would choose Tymmera's Room of Glass; just pop a cat-bed or two in the corner and it would be perfect. This book is full of useful information. You can just look at the pictures and you will enjoy doing this. There is a description of each particular shed in terms of size, time to create and approximate cost. 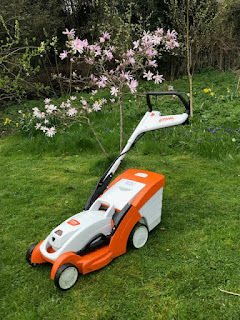 There are also descriptions of different ways a shed can be constructed and materials that might be used and the author's case study with useful tips on painting, flooring choices. There is also a step by step guide on how to construct a kit shed. So when I sat down to look at this book I thought I would just be thinking about aesthetics, instead I found myself reading some really useful information that will help my own quest for a shed. I also found I was thinking more about the aethetics of my shed than I had expected. This is a good and interesting book.